Summary: Create a simplified intranet as a dev/test environment in Microsoft Azure. Connected to the Internet to install updates, access Internet resources in real time, and participate in public cloud technologies such as Microsoft Office 365 and other Azure services. Remotely managed using Remote Desktop connections from your computer that is connected to the Internet or your organization network. For application development and testing. As the initial configuration of an extended test environment of your own design that includes additional virtual machines, Azure services, or other Microsoft cloud offerings such as Office 365 and Enterprise Mobility + Security (EMS). In this method, you use an Azure Resource Manager (ARM) template to build out the simulated intranet. 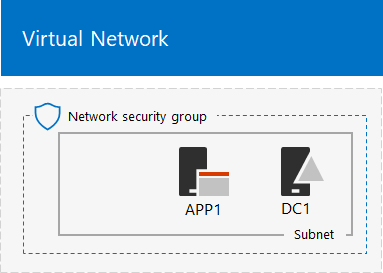 ARM templates contain all of the instructions to create and configure the Azure networking infrastructure and the virtual machines. The Azure subscription name. You’ll need to enter this label in the Subscription field of the Custom deployment page. The Azure resource group name. You’ll need to enter this label in the Resource group field of the Custom deployment page. Use this method if you want to get experience creating elements of Azure infrastructure one command block at a time with PowerShell. You can then customize the PowerShell command blocks for your own deployment of other virtual machines in Azure. If you do not already have an Azure subscription, you can sign up for a free trial at Try Azure. If you have an MSDN or Visual Studio subscription, see Monthly Azure credit for Visual Studio subscribers. Virtual machines in Azure incur an ongoing monetary cost when they are running. This cost is billed against your free trial, MSDN subscription, or paid subscription. For more information about the costs of running Azure virtual machines, see Virtual Machines Pricing Details and Azure Pricing Calculator. To keep costs down, see Minimizing the costs of test environment virtual machines in Azure. 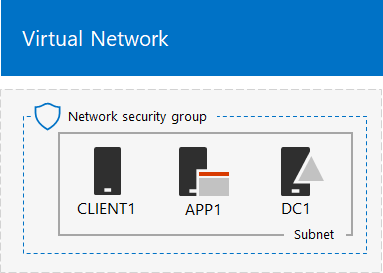 In this step, you the TestLab virtual network in Azure. First, start an Azure PowerShell prompt. Click here to get a text file that has all the PowerShell commands in this article. Next, create a new resource group for your Base Configuration test lab. To determine a unique resource group name, use this command to list your existing resource groups. 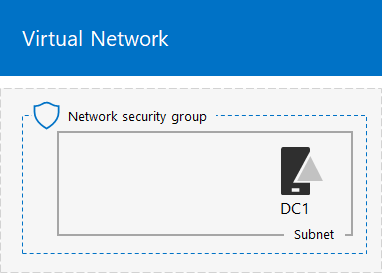 Next, you create the TestLab virtual network that will host the Corpnet subnet of the base configuration and protect it with a network security group. In this step, we create the DC1 virtual machine and configure it as a domain controller for the corp.contoso.com Active Directory Domain Services (AD DS) domain and a DNS server for the virtual machines of the TestLab virtual network. Before executing the following command block, ensure that the Azure region (location) that you have chosen supports the Azure virtual machine size, which by default is set to Standard_A1. Click here to see the latest information on Azure virtual machine sizes and locations. To create an Azure virtual machine for DC1, fill in the name of your resource group and run these commands at the Azure PowerShell command prompt on your local computer. $vm=Set-AzVMOSDisk -VM $vm -Name "DC1-OS" -DiskSizeInGB 128 -CreateOption FromImage -StorageAccountType "Standard_LRS"
Next, configure DC1 as a domain controller and DNS server for the corp.contoso.com domain. Run these commands at an administrator-level Windows PowerShell command prompt. Install-ADDSForest -DomainName corp.contoso.com -DatabasePath "F:\NTDS" -SysvolPath "F:\SYSVOL" -LogPath "F:\Logs"
After DC1 restarts, reconnect to the DC1 virtual machine using domain credentials. In Windows Security, click Use another account. In User name, type CORP\[Local administrator account name]. Next, create a user account in Active Directory that will be used when logging in to CORP domain member computers. Run this command at an administrator-level Windows PowerShell command prompt. Note that this command prompts you to supply the User1 account password. Because this account will be used for remote desktop connections for all CORP domain member computers, choose a strong password. Record the User1 account password and store it in a secured location. Next, configure the new User1 account as an Enterprise Administrator. Run this command at the administrator-level Windows PowerShell command prompt. Add-ADPrincipalGroupMembership -Identity "CN=User1,CN=Users,DC=corp,DC=contoso,DC=com" -MemberOf "CN=Enterprise Admins,CN=Users,DC=corp,DC=contoso,DC=com","CN=Domain Admins,CN=Users,DC=corp,DC=contoso,DC=com","CN=Schema Admins,CN=Users,DC=corp,DC=contoso,DC=com"
Close the Remote Desktop session with DC1 and then reconnect using the CORP\User1 account. In this step, you create and configure APP1, which provides web and file sharing services. To create an Azure Virtual Machine for APP1, fill in the name of your resource group and run these commands at the Azure PowerShell command prompt on your local computer. $vm=Set-AzVMOSDisk -VM $vm -Name "APP1-OS" -DiskSizeInGB 128 -CreateOption FromImage -StorageAccountType "Standard_LRS"
To check name resolution and network communication between APP1 and DC1, run the ping dc1.corp.contoso.com command and check that there are four replies. Next, join the APP1 virtual machine to the CORP domain with these commands at the Windows PowerShell prompt. Note that you must supply the CORP\User1 domain account credentials after running the Add-Computer command. After APP1 restarts, connect to it using the CORP\User1 account, and then open an administrator-level Windows PowerShell command prompt. Next, make APP1 a web server with this command at the Windows PowerShell command prompt on APP1. In this step, you create and configure CLIENT1, which acts as a typical laptop, tablet, or desktop computer on the Contoso intranet. To create an Azure Virtual Machine for CLIENT1, fill in the name of your resource group and run these commands at the Azure PowerShell command prompt on your local computer. $vm=Set-AzVMOSDisk -VM $vm -Name "CLIENT1-OS" -DiskSizeInGB 128 -CreateOption FromImage -StorageAccountType "Standard_LRS"
To check name resolution and network communication between CLIENT1 and DC1, run the ping dc1.corp.contoso.com command at a Windows PowerShell command prompt and check that there are four replies. Next, join the CLIENT1 virtual machine to the CORP domain with these commands at the Windows PowerShell prompt. Note that you must supply your CORP\User1 domain account credentials after running the Add-Computer command. After CLIENT1 restarts, connect to it using the CORP\User1 account name and password, and then open an administrator-level Windows PowerShell command prompt. Next, check that you can access web and file share resources on APP1 from CLIENT1. In the Address bar, type http://app1.corp.contoso.com/, and then press ENTER. You should see the default Internet Information Services web page for APP1. Your Base Configuration in Azure is now ready for application development and testing or for building additional test environments. Click here for a visual map to all of the articles in the Office 365 Test Lab Guide stack. Create the test environment and perform your needed testing and demonstration as quickly as possible. When complete, delete the resource group for the test environment. Shut down your test environment virtual machines into a deallocated state. To shut down the virtual machines with Azure PowerShell, fill in the resource group name and run these commands. 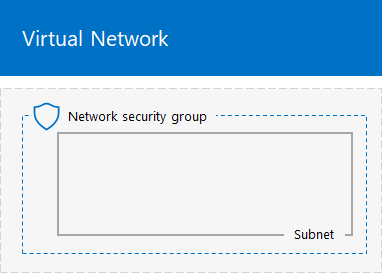 To start the virtual machines in order with Azure PowerShell, fill in the resource group name and run these commands. Start-AzVM -ResourceGroupName $rgName -Name "DC1"
Start-AzVM -ResourceGroupName $rgName -Name "APP1"
Start-AzVM -ResourceGroupName $rgName -Name "CLIENT1"